After defeating Memphis and Murray State in midweek games this week, No. 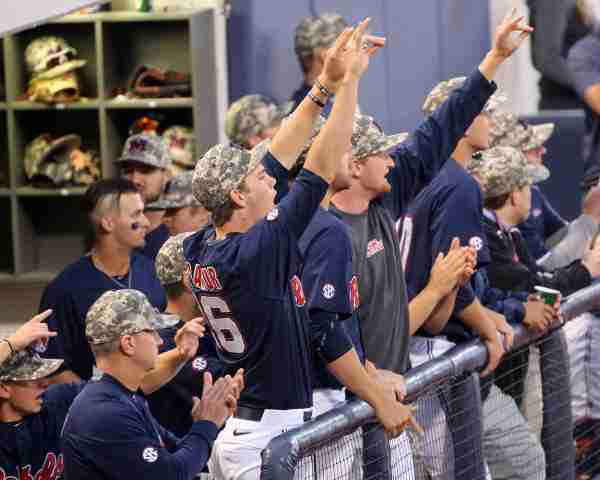 14 Ole Miss hosts a key series with Auburn this weekend at Swayze. The Rebels (28-10, 7-8, SEC) and Auburn (18-19, 5-10 SEC) begin play at 6:30 p.m. Friday night. Brady Bramlett is the probable starter for Ole Miss in game one. The right-handed Bramlett has not allowed a run in his last two starts, totaling 13.0 innings pitched. He is 6-2 on the season with a 2.19 ERA. Earlier this week, Bramlett was named to the National College Baseball Hall of Fame’s 2016 National Pitcher of the Year Award Watch List, while last week he was named a Louisville Slugger National Player of the Week for his performance against Arkansas on April 8, 2016. In that game, he pitched seven shutout innings and recorded 12 strikeouts. The Tigers are 5-10 in the SEC and lost four SEC series in a row before taking two-of-three from Tennessee last weekend in what was their first series win of the season. Despite their record, the Tigers are one of the stronger offensive teams in the league, hitting for a team average of .317. Auburn’s junior outfielder Anfernee Grier leads the conference in hits (67) and ranks second in batting average (.414), runs (46) and on base percentage (.497). The Tigers have had their struggles on the mound this season and have a team ERA of 5.88, ranking them 13th in the league. Junior Cole Lipscomb, a right-hander, will get the probable start vs. the Rebels on Friday night. Lipscomb is 1-3 on the season and has a 6.34 ERA. Right-hander Justin Camp, the probable Saturday starter, is the only Tiger who has made a start for Auburn on all nine weekends this season. The redshirt-senior threw a complete-game shutout in his last outing, allowing the Vols just two hits while striking out seven. Auburn’s head coach, Butch Thompson, is the former pitching coach at Mississippi State and is in his first season as the Tigers’ head coach. Ole Miss is outscoring opponents 38-15 in the first inning of games and holds a 14-2 record when scoring in the opening inning. Much of the reason for this can be attributed to the outstanding play of Tate Blackman, Colby Bortles and J.B. Woodman. Second baseman Blackman has reached base in 23 of the last 24 games. He leads the team in hits (44) and multi-game hits (13) and ranks second in runs scored (28) and third in RBI (26). Junior Colby Bortles leads the Rebels with 15 doubles in 2016. 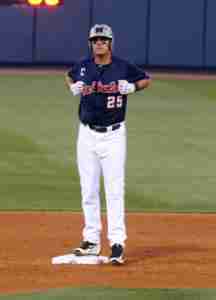 Not surprisingly, Bortles’ 15 doubles place him first among SEC hitters and 18 nationally. 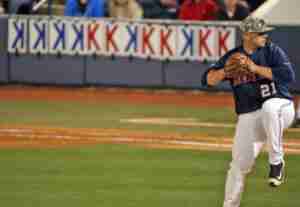 Ole Miss Baseball media relations reports just how much of a clutch hitter J.B. Woodman is. The Rebels’ statistics show the team’s co-captain is hitting .414 with runners on base and boasts an amazing .469 average with runners in scoring position. With a runner on third and less than two outs, Woodman has brought the runner home in eight out of 10 chances. The last time Ole Miss and Auburn met at Swayze Field, the Rebels swept the Tigers (April 4-5, 2014).